This week we take a look at photos snapped between 12/22/14 – 12/29/14. @justinfignewton scored a nice haul this Christmas. Points to @sasquatchstalkr‘s family for their excellent craftsmanship. Christmas gift from my family. Have a squatchtastic New Year. I believe! I believe! 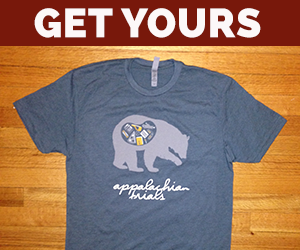 Photo courtesy of our friends at @appalachiantrail. We spotted #Santa in Damascus, VA, and he’s rocking an #AppalachianTrail tattoo! Often now I’ll roam. Onward and upward I wander on. Photo courtesy of @tndirtbag. Looking at this picture from @peterrnelson almost makes me want to go for dip in the water were it not likely beyond frigid. This shot from @_inclined has it all. Depth, layers, and a puppy. What more do you need? @wisco_wanderer gives us a little greenery to momentarily break up the continuous blankets of white. Gettin’ a little deep. Just a little. Photo courtesy of @fly522. Trail signs already getting buried. That’s a lot of pow! Another from @_brettevans as he takes a moment to bask in sweet serenity. Take a moment today, breathe, reflect, then smile. Repeat as needed. @gopaddlefaster takes a ride across the Kennebec. Finding nature denied them the privilege of mountain-top view, @julieannhartley1 decided to create one of his own. Heh. Pooky. Photo courtesy of @figtreephotography. Pooky warming himself in the rising sun on top of Blue Mountain. @whitemountainod gazes upon a sea of white from atop Lafayette. After hiking the ridge all day in the clouds, our waiting on the Mount Lafayette summit for the clouds to lift proved worth the wait! For our efforts, we were awarded a beautiful view of the Franconia Ridge Trail (part of the AT) heading toward Garfield, as well as a lovely sunset from the Old Bridle Path. It’s views like this that make the early rising and the effort climbing all so very worth it! The end of an era. Let’s all bid a fond farewell to the Bounce Box, Miss Janet’s trusty steed that carried so many of our stinky asses back and forth to and from the trail. May it rest in peace. Photo courtesy of @nadeau77.